Recorded as Haughan, Haughin, Haughian, Haughhan, and most often as Haughton, this is a multi national and confusing surname. It can be either English, Scottish or Irish and is found in all three countries and in all spellings! It is said that Haughton was originally English and locational from several places called Haughton in the counties of Cheshire, Durham, Lancashire, Northumberland, Shropshire and Staffordshire. If so it derives from the pre 7th century word halh, meaning a nook or valley, and '-tun', a village or settlement. Haughton in Nottinghamshire appears in the famous Domesday Book of 1086 as 'Hoctun'. 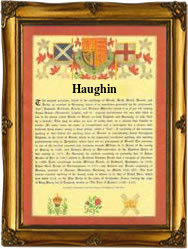 The Haughan's, Haughin's, Haughian's or Haughton's in Ireland may be the descendants of English settlers or of pure Gaelic ancestry, and therefore Irish or Scottish. If so the original form was probably O' hEachain or MacEachan, meaning the male descendant or son of a follower of St. Eachan, an 8th century saint. Early examples of recordings include Desmond Haughton, who was granted sixteen hundred acres of land in South Wexford in the year 1600, Richard Haughhan who was christened at St. Giles Cripplegate, city of London, on November 23rd 1629, whilst Mary Haughin or Haughlin aged 15, given as being a spinster, was a passenger on the ship Reliance of Liverpool. This ship left Liverpool bound for New York on May 6th 1846, and may have picked her up in Ireland. Perhaps the first recorded spelling of the family name in church registers may be that of Edward Haughhan. He married Elizabeth Anthony at St. Dunstan's, Stepney, on November 7th 1574. This was during the reign of Queen Elizabeth 1st , known as 'Good Queen Bess', 1558 -1603. Surnames became necessary when governments introduced personal taxation. In England this was sometimes known as Poll Tax. Throughout the centuries, surnames in every country have continued to "develop" often leading to astonishing variants of the original spelling.